A go-getter attitude is what it takes to come up with a successful retail store. I am sure you know which product fits your customers need but do you think when combined together they look that great off the rack as well? A Successful retail interior design is said when a large section of products is displayed together featuring a uniform look. Retail counters when set right can capture the attention and create a mood for people around. And you know what the best part is? You don’t need to invest loads of money in designing your store because minimal budget if used wisely can work wonders in getting those all important sales. But the question is how? Have you ever wondered what element of your store attracts more consumers to your space? It’s the way you present yourself through a threshold. It is a common psychology that from the moment someone enters your store he or she decides whether they wish to make a purchase and check out or leave without even making a single purchase. Also known as the “decompression zone, the threshold area is the first and foremost space that your prospective customer steps into as soon as they enter your store. If your store is too large, you can have fifteen feet worth of space, but if it is too small- five feet is enough. Basically, the threshold depends on the overall size of your store. Also known as the space where your current or potential customers make the transition from the outside world. The first experience what you have to offer. Now switching over to the shopper’s point of view, the crucial judgment requires to be made like how high or low your store is likely to be. In addition to this, how well coordinated your lighting, fixtures, displays, and colors are. And since your customers are in a transition mode, they might miss any product, signage or carts placed there. This is a well-known fact that most of the consumers tend to turn right unconsciously upon entering the store. And maybe that’s the reason why they see is often referred to as a “power wall” – as it acts as a high-impact first impression vehicle for your merchandise. So while designing the right section of your retail interior design just make sure to give it special attention regarding what you choose to display and how you display it. In addition to this, you need to keep in mind which products must be held on display- is it seasonal or anything new, high profit or products high in demand or out of the blue you wish to come up with a section that reveals your product’s stories. Create a walking path- After moving right don’t confuse your customers by placing things on a random basis. Instead try creating a feasible path using furniture, display, racks and other tools so that your customers can easily walk through. Of course, depending on the overall size of the store you need to create a well-thought-out path that strategically controls the ebb and flow of foot traffic in your store. However, most stores use a circular path clockwise or anti-clockwise so that customers can easily walk through to the back. But always remember this- where the eyes go, the feet will follow. There is no particular cookie-cutter rule when it comes to designing a retail store. But if you don’t have the funds to contemplate an expensive overhaul, you can go through the below-mentioned ideas they work wonders without blowing your budget. Signs have always been one of the best ways when the store owner wish to announce sales, deals and other enticing promotions. Now designing new print signs can be expensive so try using plug and play signage software that makes everything hassle free. Incorporating “green” or “living walls” into the retail spaces at window displays, the point of sale locations or in fixed merchandising areas is the best thing to do. This effect provides a connection to nature, and of course, it doesn’t require any maintenance. Try making use of plants or natural elements that need no water, misting, light or soil. According to several studies, retail customers consider businesses that incorporate nature to be worthy of prices up to 25% higher. Music plays a very crucial role in affecting the mood of your potential customers. Apart from choosing the right track, how will it sound (volume) must be taken into account. Several researches have proved that music has a direct impact on the buying behavior of the customer. Think of Bluetooth speakers, they act as an ideal solution when it comes to creating a pleasant shopping environment. 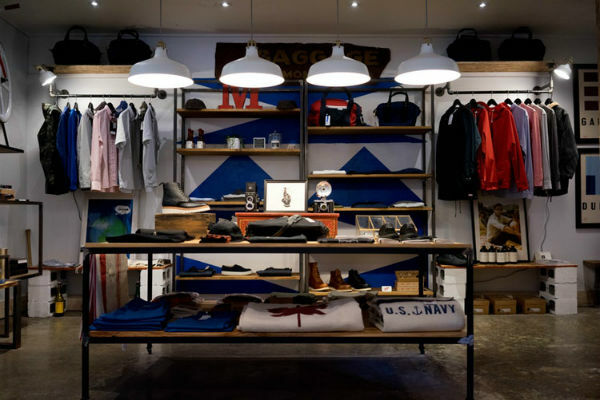 Replacing your old, dull light bulbs with new ones can make a ton of difference in creating an ambiance for your store. Have you ever thought of re-purposing or recycling items? This can create interesting accents and highlights that will definitely draw attention to your shop. For example- using old bike rims as a chandelier base. Apart from this, you can even think of adding mirrors by the window with a proper angle to make your space feel larger or incorporate abstract art because it’s unique. It’s your retail interior design that reveals to your customers how much time , money and energy you have put into your business, and in turn, will let them know if it’s worth visiting or not.